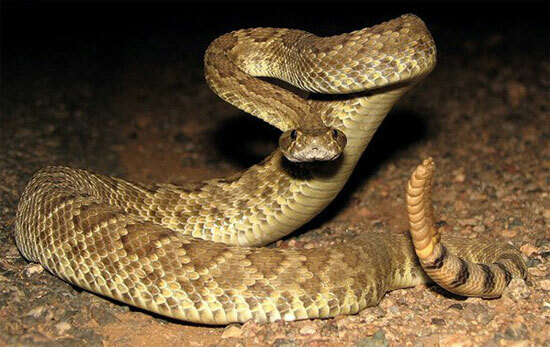 Adults 24 - 51 inches long (61 - 129 cm) Most snakes encountered are from 18 - 40 inches in length. Newborns are about 10.5 inches. Ground color varies from greenish gray, yellow, tan, olive green, to brown. Irregular, dark, well-defined, diamond or near diamond-shaped dorsal markings. Black and white rings surround a thick tail. The black rings are narrower than the light rings, and often offset. A rattle on the end of the tail, consisting of loose interlocking segments. A new rattle segment is added each time the skin is shed. Newborn snakes do not have a rattle - just a single button which does not make a sound. Similar to and easily confused with the Western Diamond-backed Rattlesnake, though there is little range overlap in California. Eats small mammals, including ground squirrels, mice, rats, rabbits and hares, and occasionally lizards, snakes, and toads. Live-bearing; young are born July - September. Male to male combat occurs. You can see two snakes wrestling on this UTube movie. Found in southeastern California from the Colorado river roughly near the San Bernardino County line, west through the Mojave desert, north, east of the Sierras into Inyo County. Absent from the southeastern Colorado deserts, but there are unconfirmed reports of sightings west of the Colorado River in Imperial County. Ranges north into Nevada, east into west Texas, and far south into Mexico. Inhabits grassland, desert scrub, rocky slopes, creosote bush flats, open juniper woodland, and light chaparral.